Perhaps the most important benefit of print media is tangibility. Among the reasons why many people prefer print is to do with the feel of the paper, having it in their hands means that the content is real, it exists. Print media is unique in its capability to trigger a number of senses; of course the feeling of paper, the smell of the ink or of an added scent, paper can be eaten or even listened to (when a chip is added). Paper can change colour when heated or put in front of a light, an ad can feel rough as sand or smooth as silk, all adding to the sensory experience of the advertising. Triggering multiple senses will add to the effectiveness of print advertising. Martin Lindstrom, writer of Brand sense, says that when brands appeal to more than three senses, advertising effectiveness will increase with 70 per cent. Direct mail uses its ability to gain access to people’s homes and lives to deliver a targeted sales message, while door drop have an enviable reach and ROI. Finally, catalogues provide inspiration for customers before leading them online to make the purchase. On their own, each channel fulfills a vital marketing role. When combined with other media, they are a highly effective force for any campaign, for any brand. Print media offers a host of content areas: news, information, education, inspiration, special offers and entertainment, all of which generate engagement between the reader and the advertised brands. Indeed, advertisements are as much a part of the reading experience as the editorial content, with magazines and newspapers providing exactly the right context for a relevant brand campaign. Print media exists in many forms: from mass media (hundreds to millions of copies) to one-to-one (the personalised version). In between, there are formats such as the personalised newspaper or magazine – titles that have content tailored to the specific reader. Modern digital presses offer marketers, media and advertising professionals the ability to print entire publications based on the profile and needs of their consumers. Or even to integrate digital content in a mass produced magazine or newspaper. This personalisation adds to the effectiveness of the print medium as consumers prefer a tailor-made approach to the generic. Such flexibility and adaptability allows the marketer and brand owner to choose exactly the right print media for their brand. An effective marketing campaign works best when print is used with other media as one element of an integrated solution. Research has shown that adding print to the advertising media mix will increase the ROI of the overall campaign. 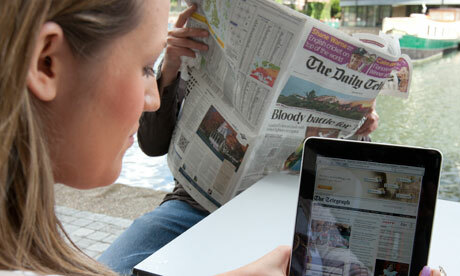 Print media will not only add to the ROI, it will also enhance the ROI of TV or online in the mix. BrandScience analysis of 500+ European cases shows that, in case of FMCG, TV’s ROI increased with 61 per cent when used in combination with print advertising and the campaign ROI increased with 57 per cent with the combination of TV and print media.